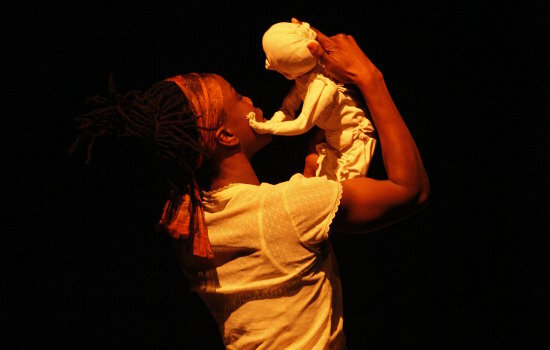 Vicki Amedume, artistic director of Upswing, talks to Sideshow about the company's latest show, Fallen – about the mix between the autobiographical and the universal, and how her own and her mother's experience of moving to the UK from Ghana have formed the emotional core of the work. What's been the seed of Fallen? Every piece of work I make is probably a little bit of a reaction against the last piece of work that I made... Fallen feels like its come about quite organically, but I think it was a process of whittling down – trying out lots of ideas and kind of discovering how I wanted to use the skills, but also realising that the work I wanted to make needed to come from something that I was really passionate about and interested in. And I'm really passionate about and interested in stories – but I haven't trained in theatre and I'm not a writer so I had to find a different way of trying to tell the stories I was interested in. The original idea for Fallen was I wanted to tell my mother's story and, through telling her story, tell my own story about our experiences when we first came to the UK. But I realised quite quickly that that was too personal, too specific, and in the creation of the show it's moved away from my personal story somewhat and become more universal. When we first came to the UK, from Ghana, I didn't speak English: we learnt it in the first few months we came here, because we were very young and able to absorb language really quickly. And I think perhaps I don't have a huge interest in using words because words were not important to me in my early years. I spent a lot of time and got a lot of information just watching people and watching their gestures and their expressions, and I think that's why I'm interested in physical performance and not text-based performance. The thing about circus is I think if you can connect it to an emotional narrative it can be a really, really powerful way of kind of illuminating somebody's emotional experience – like very literally the fear of falling, the fear of kind of giving yourself up, of being thrown into situations, of disconnection and control. There are a lot of really strong visual metaphors that you can use in circus, but I feel a bit of a fraud actually saying circus when I think about this piece. In making Fallen, every time I tried to include anything that felt kind of glossy or really rehearsed – anything that felt like a routine – it suddenly seemed wrong and slightly disrespectful to what we were trying to portray, so a lot of the way we use the equipment is to create these kind of visual images and explore an atmosphere or a sense, so it's going to be quite interesting to see what people think it is. Yeah, probably. Which is horrible for me because I love circus. When I started my career I started in traditional circuses, doing everything from swinging trapeze in spangly outfits to elephant riding, and I got to appreciate very quickly that it's actually incredibly difficult for people to do traditional circus. When you're working in theatre I think there's a tendency to dismiss traditional circus, but I don't at all, I love it, and I love going to see shows where you see somebody doing something virtuosic. It's just for this particular piece every time we did something like that or attempted something like that it felt completely wrong. Not to say there aren't any skills in Fallen – there are, but I think we've used them in a different way. So what are the skills you use? There's a lot of harness work in the show, some silks, a lot of kind of ground-based movement. You've worked with harness quite a bit in the past. What's its appeal? I think for the last couple of pieces we've done a lot of harness work, but that's because I worked with people who hadn't trained traditional circus and I discovered quite quickly that you get to more interesting places by freeing them up from the technicalities somewhat. That's not to say that harness work isn't really technical in its way, but because I've worked a lot in the past couple of years with dancers the harness allows them to keep a lot of the vocabulary that they're comfortable with – you know, the freedom of moving your arms and legs, and being able to be expressive with your whole body without having to hold on. It starts them on the journey of going into the air . With Sera [Adetoun] and Garry [Benjamin], for this piece they've learnt some tissu, but I think I think I've been interested in harness work because it's allowed me to play freely with different types of performers over the last couple of years. I think I'm coming full circle now, becoming more and more interested in traditional equipment – more and more interested in rope and the visual vocabulary that it provides as well. It's just been experimentation – seeing what you can do. There's this piece we worked on [Loved Up] where we were working with hip-hop dancers and I really wanted to explore that explosive power that you get. One of my big frustrations with traditional equipment when I've worked on it before is that continuous fast movement is hard to achieve. And in that piece, because of the way hip-hop is about having continuous fluid movement, we needed to work with hip-hop dancers – we couldn't work with aerialists and train them to do hip-hop. Working with hip-hop dancers and training them to do some aerial just seemed to be a better way of going about the process. The other thing about the choices of equipment that I've made in the last few years is that I'm very interested in working with people who have different training – because I'm interested in what they can bring to what I already do. I'm interested in kind of what their journey is, seeing what they can achieve as they move from one piece of equipment to the next, and what they bring to it. I find that really fascinating because when I trained I trained very traditionally – it was a very European style with a European aesthetic, and I always felt that I wanted it to be different but didn't quite get there myself. I'm interested to see when you bring different bodies and different techniques into play where that's going to take it – I think that as an artfom then if you stop allowing change, if you stop allowing evolution, you become a bit of a museum piece. Sera and Garry – are they trained as dancers? Sera wouldn't call herself a dancer but she is; Garry danced with Phoenix for years. But when we were auditioning for the piece, because of the story, because of the context, because of the meaning of the layers of the piece for me, it absolutely had to be black performers on stage. But they also had to be physical and they had to be really, really strong performers – and when I say strong performers I don't mean physically strong, I mean they had to be able to hold your attention for a period of time and carry an emotional narrative. Because of the lack of black performers in aerial circus in the UK – Europe as well – it was really tough finding people. We auditioned for awhile, did a couple of callouts, and realised that OK, we're not going to find people who have aerial skills and movements skills and act and are black and are available at the right times – so we're going to have to train people up. So Sera did a lot of athletics and a bit of gym when she was younger and some dance training but not a huge amount, but she's a very strong natural actress, and Garry's a really strong dancer. And I felt that I had more chance of getting where I wanted to be with the two of them than bringing in people who had aerial skills but didn't have the all-round skills that it needed. In the last couple of years as well I've worked with a lot of companies, a lot of other directors, working with actors who have no previous circus experience and having to train them up for certain productions. So I developed an experience of teaching people from scratch to get them to a certain point for performances. But those performances have always been scripted and I've been able to plan out the performers' training in advance knowing exactly what point they needed to get to. For this show, because it was devised, I couldn't pre-plan exactly what they would do in the show, so we had to spend a lot of time doing all-round training – which has been tough on them and tough on us, but fortunately they've both kind of bought into it wholeheartedly. It's not just learning the strength and learning the techniques, it's a whole kind of mental process that you have to be able to go through to learn whatever it is you need to learn and perform it on stage under pressure. In looking for those all-round performers, with the mime skills and presence as well as technical ability, do you feel like it's hard to find them in circus? No, I think that's why I made my life really, really hard for this project – because there are circus performers out there who have the skills and are fantastic performers – not a lot of them perhaps, but I think there's not a lot of really talented people in any artform, and I think in circus we're just a smaller sector. But I think I made my life particularly hard for this piece because I needed black performers specifically – so I couldn't turn to the people I know who are talented or who do fill the technical criteria because they weren't appropriate for this piece of work. Also I think there aren't huge amounts because historically in the UK circus hasn't been something that you train in at an early age to end up at a point of expertise as an all-rounder. Lots of people come to circus from lots of different places so there isn't like an industry standard – people fall into it. And it's fantastic because you have this huge melting pot of people who come from all kinds of different backgrounds and places and are just united by the fact that they're all passionate about this artform. But it also means there's this label circus artist that's applied to all of us. What does that mean? What is a circus artist? Someone who's a performer and is incredibly technically good? Is it someone who's a fantastic deviser, perhaps not as technically good but very imaginative about the way they work? I think were just a big melting pot, and I don't think we've got to that point of kind of defining and dissecting the artform and kind of separating it out. And I'm not sure whether that's going to be a great thing when it happens. For people to take you seriously as an artform you have to have all these words, all this language, and be able to define yourselves and be able to talk in a way that people perceive as articulate. You have to have labels and form and styles and structure, all that kind of stuff – and I don't think circus has it at the moment. And I think that's what makes it such a great, warm world to be working in, and I think that as soon as that starts to happen we might be taken more seriously, but it'll be less fun, won't it? You said earlier that when you make a new piece you're reacting against the last. Your last piece was Loved Up, so what in that were you reacting against? That show's been through three different iterations and had three different casts, but it's always been about youth, vigour, freshness, fun, bounciness, and it's been about that whole thing with hiphop that I love that it just makes you want to move. But I'm really interested in storytelling and I think Loved Up was an experiment in physicality but it wasn't an experiment in storytelling. And I'd worked with a couple of really interesting directors and was fascinated by the way that they worked with the material that I gave them, to shape a story, and I really wanted to explore that in Fallen: how you can shape a story, working with somebody like me who's from a circus background, not a text-based theatre background – to see if it was possible more than anything. And for me the interest in circus was its ability to create these really interesting visual metaphors for feelings, so the whole thing was kind of exploring those feelings of isolation and dislocation, and exploring circus in a way that makes it almost pedestrian. I know that sounds like it's going to be the most boring thing that you've ever seen. But often when circus is used in theatre it'll be for that magical character or for a moment of fantasy, and I wanted to see if it was possible to have a piece where the circus was included in a way that moved quite naturally through the piece, and I think that's the challenge with making narrative circus – to be true to the narrative but also keep the interest and the power of the physical skills and not reach a point where both suffer. It's an ongoing experiment. What's the benefit of using a story rather than creating something that exists free of traditional narrative? I think storytelling for me doesn't come from England, it comes from my heritage – storytelling in Africa, in Ghana, its not just entertainment, it's a means of communication. When I talk to my mother – it's hard to explain... even the language in Africa: something that can be said in a couple of words in English, the same phrase in Africa is a much, much more flowery phrase. It's much more proverbial and things are told in analogies and connections, so I think I've been brought up with that interest in stories. When we first came to the UK my mother used to do shift work so she was often away from us, and what she'd do to keep a connection when she was away was she'd tape lots and lots of stories for us and when we went to bed and she wasn't there we'd listen to the stories on tape. So I've kind of grown up with stories. I have an interest in people as well – I find that when I go and watch things I'm always trying to make up a story in my head, always trying to understand what's happening, and I find it difficult to go to see something where I feel like I'm left swimming. If you're trying to create a mood then that mood needs to be created really, really strongly, and as soon as that mood's created you want to connect it to a story or make sense of it yourself. I think for me stories are how I make sense of the world, so naturally in my work I want to explore that. But I think we get confused when we say stories – they don't have to be massive, epic stories; kind of creating a mood often is the story. As soon as you see somebody walk on stage and sit in a chair you try to understand who they are, why they're there – and it doesn't have to be, Oh, this man walked into the room because somebody shot his wife ten years ago and now he's seeking revenge. It could be just he's upset and needs to be alone – that's a story. It's been really interesting because we started off at one point, and then working we discovered – well, a lot of things. It's evolved from the original idea of working together into something that is very lovely but is not as big a segment in the show as we originally thought it would be – simply because it's this thing of kind of trying to overload a piece with too many gimmicks, and when I was originally thinking about Fallen we spent a lot of time trying to storyboard the piece, trying to write it out as a series of visual images, what the story would be, and as we've been working that's evolved, grown and changed and some of the original ideas I had about how things would work didn't feel right. It's the nature of devising – 90% of the ideas you have, when you've actually seen them you go [appalled face]. 10% of them work. But what I loved about the Paper Cinema and what works really well in this piece is it feels really rough and it feels quite alive. What I'd really like to do with Nic actually is work on a piece where he could actually be there working live with a performer because I think when we were doing the R&D that was when it was really exciting. What we've done with Fallen is use some ideas really well, but there were a lot more things that we came up with that we want to play with at a later date. The piece has already had a short tour. Is the version that will show at the Mimefest a reworked version? Fallen plays at the Lowry, Salford Quays 14 January 2011, then at the London International Mime Festival 24-26 January, then goes on tour to Lancaster, Keswick and Southampton before returning to London in the spring. Vicki Amedume was interviewed 3 January 2011 in Covent Garden's frosted Patisserie Valerie.